Tipi Rentals - Field Trips Delivered! Do you have a party, wedding, gathering, or other social event coming up? Would you like a tipi to be a part of the festivities? Maybe your child would like to have a campout in a tipi for their birthday party and sleepover! 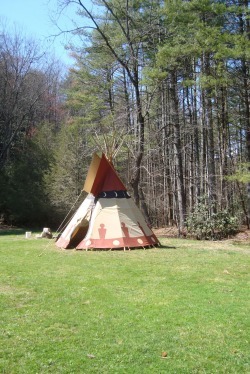 Field Trips Delivered offers TIPI RENTALS! You may rent our tipi's for up to 6 nights! Our fee is $50 per night, plus a flat $100 set up fee. This includes the complete set up of the tipi, including liner, tarps for the floor, and a fire pit in the middle so you can have a fire without scarring the ground! This also includes a personal explanation of smoke flap use to control smoke flow and a guided tour of all the beautiful intricacies of a tipi. Please contact us for inquiries and scheduling your tipi rental today!